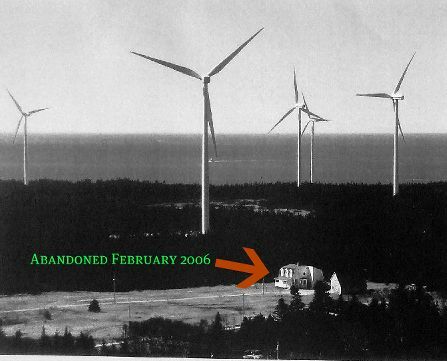 —Daniel d’Entremont wrote the following letter July 2007, describing his family’s experience with Vestas wind turbines next door to their home on Pubnico Point, Nova Scotia (Canada). The health effects from the turbines were so severe that the family was forced to abandon their home. No one would buy or even rent it. Our appreciation to the d’Entremonts for allowing us to reprint this. The Editor. Life for our family since the Pubnico Point windfarm began operating has been filled with sorrow, illness, heartache and disbelief. How could a company be permitted to enter our community and turn our pristine area into a noise-ravaged battleground? Why did it happen to us? Not that we would wish it on anyone else. First off, the community knew there was a windfarm being planned because two of the windfarm owners live in the community. They put up an anemometer tower and formed a company named Landco and proceeded to acquire the land necessary to construct their windfarm. Now they are leasing the land to their other company which owns the windfarm. Through word of mouth and some public meetings, which nearly nobody attended, people understood that the windfarm would be inaudible by the neighbors and would have no negative impact on the community. The residents of Pubnico could not visualize a 400 ft wind turbine on Pubnico point or had any idea of the impact they would have, nor did anyone research anything about it, including me. Since two of the owners were local residents and were related to most of the community, everyone wished them well. The company kept everyone in the dark about the negative effects and the few who asked any questions were lied to. The first 2 turbines were operating in May 2004. One was 4000 ft from our home, the second 4700 ft. A 120-day trial period was requied to monitor their productivity. We could hear them well and Carolyn, my wife, was experiencing ringing in her ears. Visitors would comment that the one 4000 ft away seemed really close. Some neighbors were complaining they were bothered by them at night. Three months later construction began again. People were complaining about the speeding gravel trucks and feared accidents. An older woman was rear-ended by a truck. She wasn’t hurt, but the company quickly gave her a car to drive until they returned her car repaired. Nothing more said. The heavy trucks damaged the roads. It was easy to tolerate the noise and construction dust because we knew it was only temporary. February, 2005 the windfarm was fully operational: 17 wind turbines. The windmill 4000 ft away seemed far off compared to the one 1000 ft from our home. They are loud. They’ve been compared to jet engines, [or] a plane that will not take off. There is no gentle swoosh; it is a woosh noise. They grind, they bang, they creak. The noise is like “surround” sound: it’s omni-directional. It feels like there’s this evil thing hovering above you and it follows you everywhere. It will not leave you alone. This noise will not allow you to have your own thoughts, the body cannot adapt, it’s a violation of your body. It is a noise that the human body cannot adapt to even after more than a year of exposure. As time progresses the noise becomes even more unbearable. Our 5-year-old son Elias was afraid and unable to sleep in his own bed for more than one year. He would get in our bed or in his brother’s bed. We would put him to bed at 8:30 and many nights, at 11:00, he would still be awake. Finally he would fall asleep wrapped up in the blankets in the fetal position, with his head covered and with a fan at his head (we had to create more noise to mitigate the windfarm noise). The body can adapt to the fan noise. In the morning he would get up tired and cranky. In September 2005 he started school and he was not getting enough rest. He began getting more and more agressive with his friends. He was very defiant. We knew he was suffering terribly. He’s had throat infections and often had a fever and not feeling well. In January 2006 we had our house tested by a naturopathic doctor, and she and her colleagues found the house so toxic that they advised us to move. These people were on our property for only 1.5 hours and they became so weak that they had to leave. The doctor said she couldn’t think; she couldn’t concentrate anymore. In Febuary 2006 we brought Elias and Samuel (9) to another naturopathic doctor and she also recommended that we leave our home. Our family doctor says he cannot prove that a wind farm causes medical problems, but he would not want to live or raise children where we are. We have contacted a scientist from Portugal who has studied the effects of infrasound on the human body and she also told us to leave for our sake. We abandonned our home Febuary 21, 2006. Since the move, Elias has been doing much better. He sleeps in his own bed every night. He sleeps partially covered, with his arms and legs spread everywhere. It was only ten days after the move, while he was having his back rubbed in bed, he said “it’s nice to be able to go to bed and sleep.” He is much less defiant. He has become the kind, gentle little boy he was before the windfarm nearly destroyed his life. Knowing what we know now we should have moved a year before. Our 9-year-old son Samuel was sharing a room with Elias. He was also very sleep deprived. He would get up in the morning very tired. We would send him to school tired. He was tired and unable to concentrate and his school work suffered. He was also unable to concentrate on his homework. He began to withdraw within himself. He also began getting agressive. Samuel seemed to be always angry. His teacher asked us what was the problem with Samuel because his change in behavior was something she would never have expected from him. Samuel’s ear drum burst while we were there in 2005. He’s had many throat infections and many headaches. He has developed allergies. He’s the only one of 6 children that has allergies. Since the move, Samuel has improved so much in his school work and his behavior and participation in class that the teacher says she cannot believe that he’s the same child. He has not been agressive with his friends. He’s so kind and caring for everyone. His headaches are less frequent and less severe. Our 13-year-old daughter Emanuelle had dramatic behavioral changes. She became withdrawn and was spending too much time alone in her room. She dropped her friends and lost interest in schoolwork. She was also angry. She dropped all sports (basketball, volleyball, soccer, badminton). Emanuelle always had headaches. She became very defiant. Since the move, Emanuelle is doing better in school. Her behavior is steadily improving. Her health is improving and she is socializing. She is feeling better about herself. Our 15-year old-daughter Deminica was having a lot of difficulty sleeping. She was being awakened at all hours of the night. She was asking for sleeping aids. She had numerous headaches and some throat infections.S he was very moody. She slept soundly at friends homes. She had frequent, severe abdominal pain. Since the move, Deminica is sleeping well. She has not had any abdominal pain. Her headaches are rare. Her mood has improved. Our 19-year-old son Nathaniel was sleeping in the basement. He was anxious and angry and was not sleeping well. His hands were peeling often. Nathaniel also developed vision problems. He loses sight completely in one eye or the other for a few minutes at a time. Many mornings Nathaniel had to grab his legs and put them off the bed and lift himself up with his arms. After some time he gets mobile. He has seen a number of eye specialists and undergone many tests, and the doctors can find nothing wrong with him. There was a Stair Master machine at his high school, which would measure how many stories a person could climb. Whatever the record was, the teacher felt it would be difficult to break. Nathaniel more than doubled the record, and he could carry his 140 lb. friend on his back. One year near that windfarm, and he was nearly blind and crippled. Since the move, Nathaniel is not as anxious or angry. He is relaxed and easy-going. His hands are not peeling anymore. It took one year away from the windfarm to regain his vigor. His eyes are almost entirely healed. Since the move, Nehemiah is much calmer, not anxious, and his anger almost gone. He is smiling and laughing a lot, and is content. My wife Carolyn was anxious and she had numerous headaches. She was getting up frequently throughout the night to urinate, and she was having pain with that. She could not get the sleep required to be rested. She was feeling her heart racing. She had shoulder joint pain, which required cortizone injections. Her hearing was affected on the right side. Her glands on her neck were always swollen and painful. She was feeling a vibration in her lower legs on occasion when she was outside. Carolyn’s vision is blurred and the doctors cannot find any problem with them (seems like there is a film on the eye balls). She also has high blood pressure. Carolyn spent more time in our house than any other member of the family. Since the move, Carolyn is not anxious and her headaches are fewer. She hasn’t felt the vibration in her legs. Her eyes and shoulder have not fully recovered, yet. She is sleeping much better. Carolyn is trying to find help to restore her vision. As for myself, I always felt a sensation in my chest, which was very discomforting. On extremely rare occasions when the windfarm was off, I could sense they were off without seeing them. The noise was just a relentless attack on our bodies. Every time the blades passed the towers, I could feel it within my body. I was unable to concentrate well enough to read in my bed. Since the move, I don’t have that sensation in my chest, but it returns when I spend a few hours at our house. These physical and psychological effects develop gradually, and sometimes it seems silly to associate them with a windfarm, until you learn that others experience the same thing under similar conditions. If we would have had absolutely nowhere to go, if we would have been forced to stay in our home, I hate to think what kind of physical and mental state we would be in now. During the months that the sun is low in the sky we get a flickering in the morning and late afternoon, as the sun passes behind the turbines. This induces headaches quickly in those who are more succeptible to them. When the full moon rises and passes behind the turbines, the flickering is intense. We are devastated. We are broken because we have lost the home we built with our own hands, and we have lost the land which has been in the family for generations. Our house is now unsellable.There is nobody in the community who wants to live there because of the windfarm. Nearly everybody supports us privately, but they are afraid to speak out publicly. We are a community of 2000 people. I did a survey of 216 people, and 96% said the windfarm was too close to our house. Also 89% said the windfarm was too loud at our house, and 78% said that they felt they were not properly notified of the impact this windfarm would have on the community. Many people will randomly tell me that they sense that the community would not have allowed the construction of this windfarm if they had known or realized the impact it has had. Our local politicians were all in on the great deception. Our provincial legislator said they had made a mistake, but we would have to pay for it and put up with it. He also told me to shut up about it. Other neighbors are experiencing more and more difficulty in coping with the windfarm. Instead of adapting to the windfarm, it is getting more intrusive. The neighbors are having more difficulty sleeping and the problems associated with that. One neighbor has to sleep with ear plugs in the summer. Our neighbors are like us, they love the area and the land they are on and they don’t want to move. Our children were suffering so much, the decision to abandon our home was made for us by the wind company. There have been some noise studies done at our home. They clearly prove excessive noise, even with the outdated guidelines they are using, but the windfarm is still permitted to operate full time. The turbines this company used are Vestas, V-80, 1.8 MW. The Vestas workers who had experience in a number of areas erecting wind turbines told some community members that if anyone complains, give them one year and they’ll shut up. In this case they were wrong. It’s still difficult to believe or accept what has happenned to us. It didn’t have to be this way. With proper planning and setbacks, these problems don’t need to arise again for anyone. Residents throughout the USA who face the prospect of wind farms surrounding their homes must become educated in wind development. Citizens around the world must come forward, like the d’Entremonts and the Todds (Maine) and Davises (UK) have done, to inform people of what they have endured under the turbines. It is critical that safe turbine distances from homes, and safe noise levels, be addressed to local township councils and planning boards. We cannot continue the onslaught of wind developers ruling our communities. We must force our townships to hear the negative experiences of people living near turbines. I thank these individuals for speaking out. I find it hard to believe that our governament would allow these wind turbines to invade our communities that cause the residents to become so ill as a result. It is appalling to say the least. We know a lot more about these beasts than we did years ago and how they affect our lives with proof from specialists and the people that are living with the affects of the turbines. We know now they are not the green energy that developers profess they are. It is all about $$$. They couldn’t care less how it affects people’s lives.